Description	 MS in Old Babylonian on clay, Uruk, Babylonia, ca. 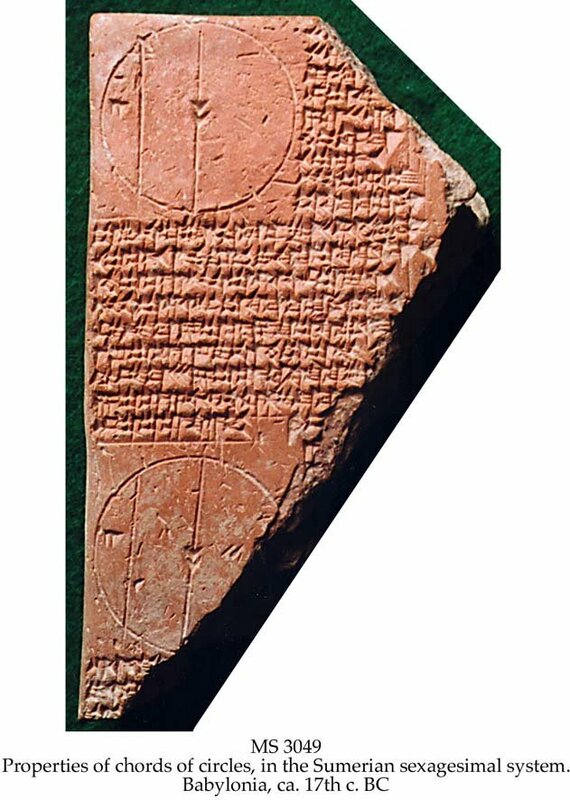 17th c. BC, upper left quarter of a tablet, 11,5x6,4x2,2 cm, single column, 43 lines in an expert cuneiform script, signed by the scribe, drawings of 2 circles with diameters and chords indicated. Commentary	 The complete tablet contained 16 different exercises on 5 subjects, 6 problems of the circle, 5 problems of quadrates, 1 problem for the triangle, 3 problems for "brickforms" (parallel-trapezes), 1 problem of an "inner diagonal", which is preserved here. This is a geometrical problem where the three-dimensional Pythagorean rule came into play, long before Pythagoras lived. This is a high quality tablet possibly from a royal library. Published	 Jöran Friberg: Matematiska kilskriftstexter i den norska Schøyensamlingen; in: Nordisk Matematisk Tidskrift, 52:4, 2004, pp. 154-156. 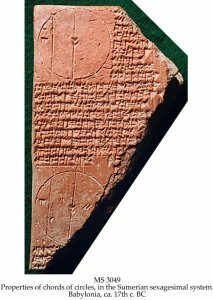 Jöran Friberg: A remarkable Collection of Babylonian Mathematical Texts. Springer 2007. Sources and Studies in the History of Mathematics and Physical Sciences. Manuscripts in the Schøyen Collection, vol. 6, Cuneiform Texts I. pp. 295-304. Colophon	 Its name: 6 arches (circles), 5 squares, 1 peghead (triangle), 3 brick moulds, 1 inner cross-over (diagonal) of a gate. This kind of subscript with a detailed summary of the topics in the text is only known on the present tablet and on MS 3042.